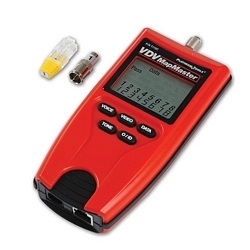 The VDV MapMaster combines continuity testing, mapping and tone generator functions. Capable of identifying and mapping 19 locations at one time, the VDV MapMaster works with 6P6C (phone), 8P8C (network) and video (coax). The tester will indicate pins with shorts, opens reversals, miswires and split pairs. Includes 9V battery, one coax remote and one 8P8C (RJ-45) remote; additional remotes required for testing multiple locations.